A cat, ready to pounce, yesterday. 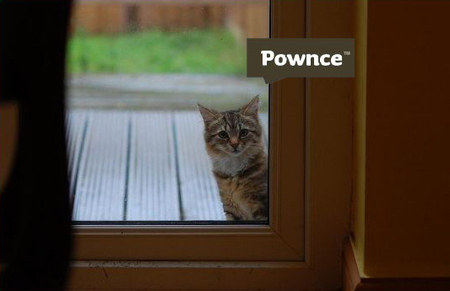 Just a short post; I’ve signed up to Pownce, the Twitter knock-off/second coming from, among others, Kevin Rose of Digg. The best thing about it is there’s a lot of vowels in the name compared to most Web 2.0 sites, but I’ve not used it that much yet. Anyway, as a result of getting in, I have six Pownce invites available, so they’re up for grabs to you, my loyal, bribeable readers. Whereas my Joost invite give-away was first come, first served, this time, there will be an element of skill involved. Leave a comment on this post and add the name of your favourite pouncing animal, and the good ones will get invites. This entry was posted in Digital Products. Bookmark the permalink. Gotta get that pounce invite…lets see my favorite pouncing animal has got to be Tigger. No, thats a bouncing animal, how about the Jaguar, in honor of my alma mater the University of South Alabama. Every morning after I get out of the shower he is ready to pounce on my feet, jump up on my office chair and get ready for our morning ritual – fighting! We both fight each other, batting hand against paw, trying to bite my fingers, me grabbing his head and closing his mouth (saying “whatcha gonna do now punk?) and other funny things. His pouncing (and fighting) are the best way to start off a day. Gimme the Pounce pretty please! Give me invite. I know where you live.